The Founding of Maryland, 1634. Oil on canvas, painted by Emmanuel Leutze in 1860 while visiting St. Mary’s City, Maryland, the site of Maryland’s first colonial settlement. Message from the Cap’n is a compilation of fishing advice, waterman and weather insights, Chesapeake history as we have learned it, and ordinary folklore from those who keep their feet wet in the Potomac and St. Mary’s rivers. After seven months at sea tossing around like a cork, the 150 or so adventurers were really anxious to set foot again on solid ground. But they were afraid to stop because they did not know if they would be safe in attempting to do so. The spectacle before them gave reason for concern as the local Yaocomico Indians had watched them easing their way up the big river toward their village. Many fires were set around the shore to announce to all that something astounding was taking place: two large canoes with clouds above them were making their way ever closer. The Yaocomico Indians were of ample stature with long hair generally braided over the shoulder and were adorned with shells, feathers along with red and blue paint. It must have been a fearsome sight along the shoreline that directed the colonists further upriver to St. Clement’s Island. This island was almost in the middle of the river and looked to be a safe stopping point to rest and celebrate mass for their good fortune of making it across the ocean. It was here that the group met Henry Fleet, the fur trader, who had a business in the St. Mary’s River. He had traded with the native tribes and knew their languages. 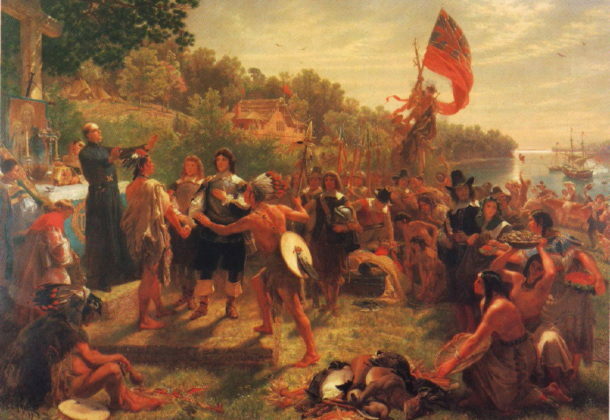 He brought the settlers to St. Mary’s and brokered a treaty with the Yaocomico for purchase of 30 square miles of land for garden hoes, hatchets, beads, mirrors, and other items that the colonists had brought with them. From the Interpretive Buoy System: The lower Potomac water temperature is 84.2 degrees Fahrenheit as of Labor Day weekend and the salinity right at 8.9 PPU (parts per unit). Hard crabs are still in good supply with the price hovering around $80 for good, fat males, but this price will fall now that the holiday has passed. Rockfish, Perch, Spot, Croaker, and Spanish Mackeral are the fish being caught as fall approaches. Recreational and charter fishermen: sign up for a fishing report from the Tackle Box. Ken Lamb has a good read on fishing in the Lower bay, and the Potomac and Patuxent rivers.